The latest issue of Time magazine features a two page advertisement on the inside cover for Ralph Lauren. Two finely suited young men are dressed in Ralph Lauren Purple Label suits. Very classic. Very stylish. 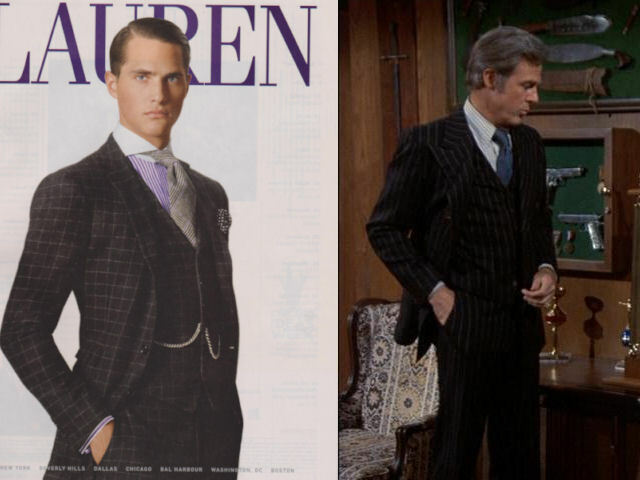 The striped shirt, print tie and three piece pattern suit in the Lauren ad reminded me of Culp’s striped shirt, print tie and three piece pin stripe suit from Columbo “Double Exposure” (1973). I’m biased, of course, but I think Culp wore it better. Previous PostPrevious What’s My Line?